The government of Madhya Pradesh has made an announcement of assembling liquor counters outside the very well-known religious site of Ujjain, Kal Bhairav Temple. The step has been taken so that the devotees are saved from getting duped by non-licensed alcohol vendors, as the devotees buy alcohol in the form of offering to Lord Kal Bhairav, an incarnation of Lord Shiva. Also known as Mahakal, the Lord is famous for consuming alcohol. This step is also noteworthy in regard to Kumbh Mela or Simhastha fair, held ones in 12 years that will be taking place next year. 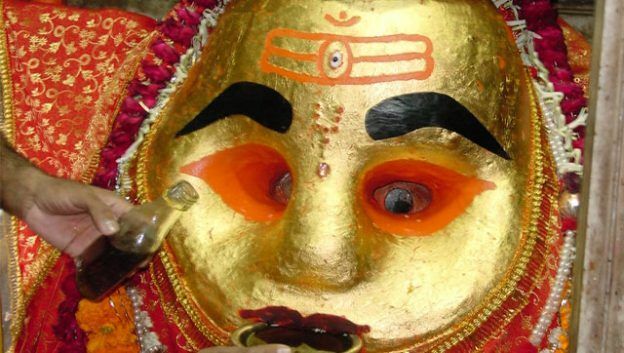 It is expected that the fair is going to be host of lakhs of devotees who would also be visiting Kal Bhairav temple, to offer alcohol in the form of ‘Prasad’. Although there are no official numbers so as to how much liquor is offered at the Kal Bhairav temple but a rough estimate says that an everyday offering amounts to several hundred of liters. Deputy Commissioner (excise) Raghavendra Upadhyay said, “Keeping in view next year’s Simhastha fair, we decided to open two liquor counters, one for (locally made alcohol) and the other for foreign liquor.” According to the new excise policy of the state government, there will be liquor counters selling both the varieties in 180-ml of bottles, from 1st April. The move has not only made the devotees happy but will also help the government in filling its treasury.